New 2017 review now added below! 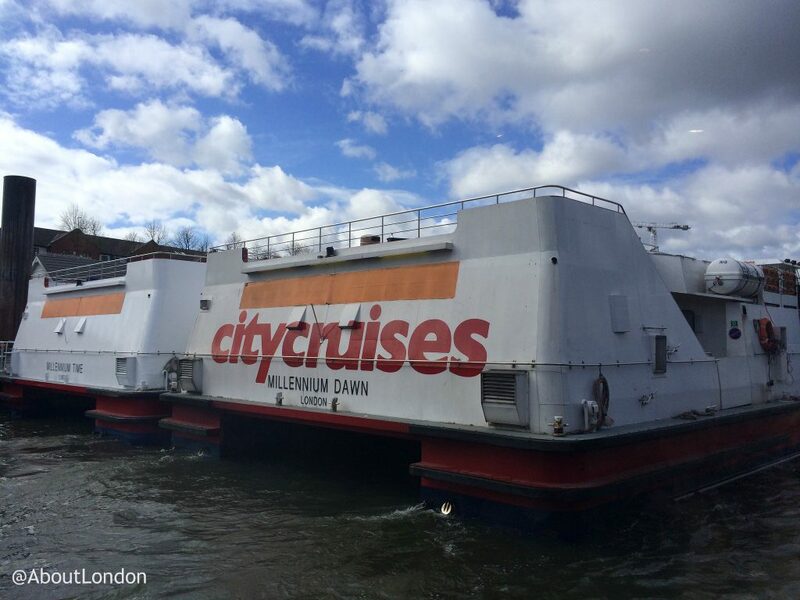 I first went on a City Cruises boat trip many years ago and wasn’t that impressed. City Cruises tickets are often tagged on as a ‘free river cruise’ with other sightseeing passes. When I tried a 1-Day London Pass in 2011 I was clearly disappointed. A ‘tour guide’ talked over the loud speakers telling us ‘facts’ and how he wasn’t paid to be a guide but staff seemed happy to wave a bucket at us for tips as we disembarked. 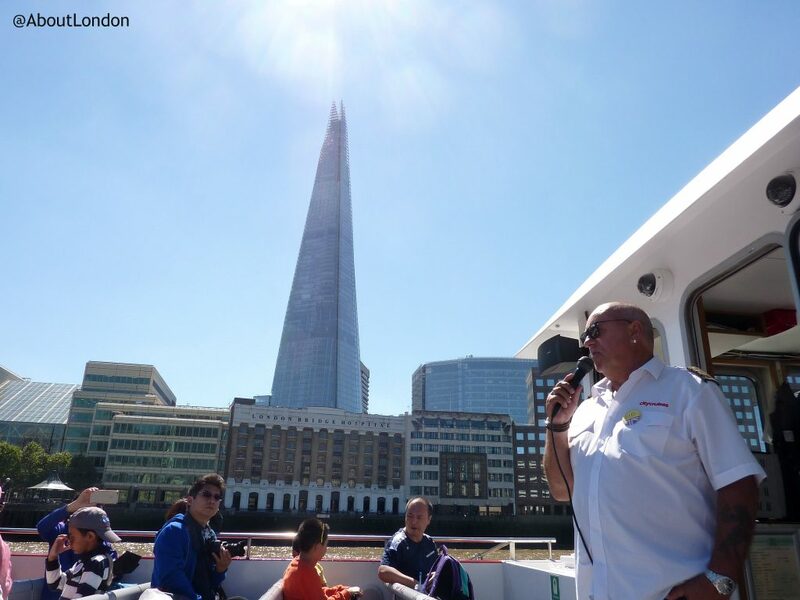 I tried another City Cruises trip in 2014 as part of a day out trying the Big Bus Tours for the day. Again, I wasn’t impressed. There was a live commentary read out but the voice was so boring it was impossible to follow. I was then appalled when this Guide then told us he wasn’t paid to give the commentary and we could show our appreciation by putting a tip in the “traditional Captain’s Champagne bucket” which is, of course, complete nonsense. 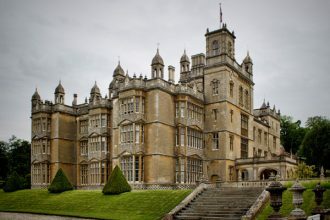 I have complained to the company and I hope things will improve but as it was three years since my last visit and it was no better I do not hold out much hope. I will say that City Cruises listened to my complaint. They had to as I recorded the City Cruises staff blatantly asking tourists to give them money. The company wanted me to go on a boat trip with a member of the management team but I declined as I felt sure the boat’s crew would consider doing the right thing if they could be seen ‘stealing’ from tourists by their bosses. Instead they offered me a ‘River Red Rover’ ticket so I could try a City Cruises boat trip again without giving them warning when I would travel. I took the opportunity to have a day trip to Greenwich and went on a Sunday. No surprise but the same thing happened. See the bucket in his hand? Maybe you’re thinking it’s one rogue member of staff. That’s what City Cruises told me when I complained. No, this was the return journey. After this trip I compared City Cruises and Thames Clippers. As you can see, City Cruises hadn’t endeared themselves to me. The live commentary was read out with such a monotonous voice that it was hard not to be bored to sleep. The Guide only livened up as we approached Tower Pier so he could try to convince unsuspecting tourists that they should pay him for doing them a great service as he had gone beyond the realm of his job description. 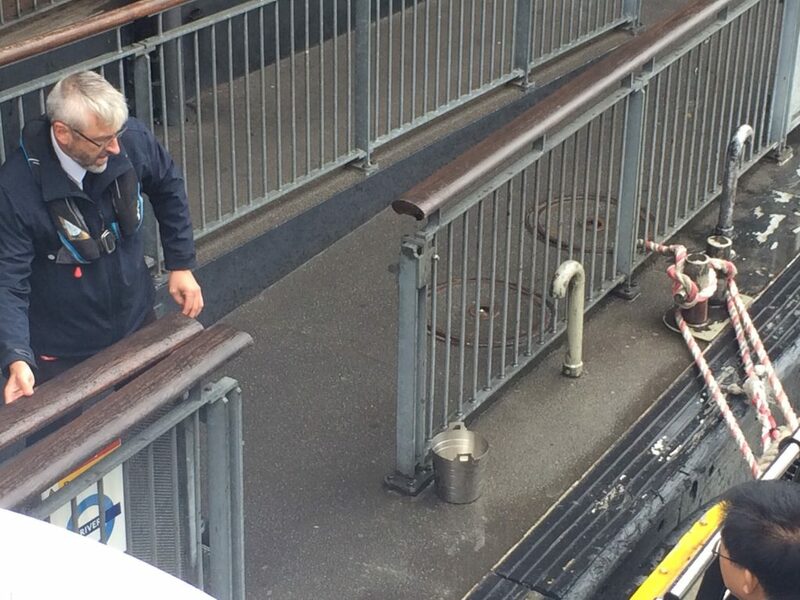 And, sadly, many people did put coins in the bucket he shook at them as they disembarked. I have reported this shameful behaviour to City Cruises management but it seems little will change as staff are so used to earning this extra cash from tourists. Which brings us to my 2016 City Cruises trip. 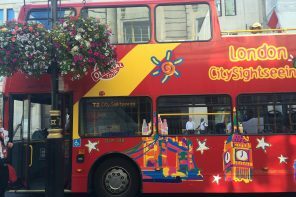 I tried the Original London Sightseeing Bus Tour for a day and it included a City Cruises ticket so how could I resist checking if they were still trying to get cash that their bosses, apparently, don’t know about from visitors to London? Oh, I took a front row seat for this one. At the start of the journey (Tower Pier to Westminster Pier) he asked if passengers would like a recorded commentary or for him to point out the sights. 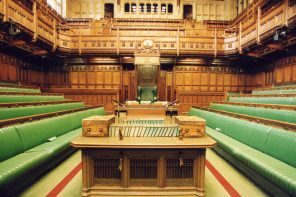 There were a few mutterings for him to speak so he complained about no-one listening anyway and came to stand at the front of the upper deck. He told us Cannon Street station is owned by ‘British Rail’ (note, British Rail changed its name in the late 1990s) and he was constantly moaning about the waste of money in London. The highlights pointed out to us included the new sewage works. “The sewage system is falling apart. London is falling apart,” said Sid in his happy-go-lucky attitude. We were told a bottle of water costs £15 in the Harvey Nichols restaurant at the OXO Tower and, therefore, it’s overpriced and no-one should go there. I called the restaurant and a bottle of water is actually £5. He told us Somerset House is the home of the Inland Revenue which hasn’t been true since 2009. And then at the end – and, I’ll admit, I knew it was coming – he started the line about ‘we’re not paid to give a commentary’ and how he’ll be waiting at the exit and adults can put money in his Champagne bucket. Just like they do on every City Cruises trip. And as I was prepared for it I recorded Sid. On the recording, I’ve noted a few more of the inaccuracies he managed to get in during the last few minutes but forward to 5 mins 30 seconds and you can here Sid saying what the bosses of City Cruises say never happens on their cruises. In case you’re thinking this surely wouldn’t have happened again, here’s Sid with his Champagne bucket to get cash from the passengers as they disembarked. And maybe you’re thinking he might just be holding that Champagne bucket for some other reason, so here’s a video of a passenger giving him money. I did let City Cruises know about this trip with them. I also let them know that in all the years I have tried them (and we have seven years of reviews consolidated here) nothing has changed. Staff make up ‘facts’ and say they are not employed to give a commentary when the company sells tickets on the fact they offer a commentary. Do let your friends know what City Cruises is really like and remind them Thames Clippers do the same routes and will never ask for money. City Cruises and staff like Sid, should be deeply ashamed of themselves for exploiting visitors to London. December 2016 Update: I was alerted to this TripAdvisor review in December 2016 which continues to prove the attitude of City Cruises and their boat crew. The author told me they too have contacted City Cruises many times over the years to complain and were also told this type of thing shouldn’t happen and must have been an isolated incident. But, of course, you now know different. How could I resist when an opportunity to check on City Cruises came my way? I took a trip from Bankside Pier which went under Tower Bridge and then turned back to go to Tower Pier, then Westminster Pier and finally (for me) London Eye Pier. And that journey took 1 hour 30 minutes. Yes, I know that journey is only a 30 minute walk (or a quick trip on the RV1 bus) but I would have missed out on the crew’s commentary and gaining more evidence of them gaining more tax-free tips from passengers. 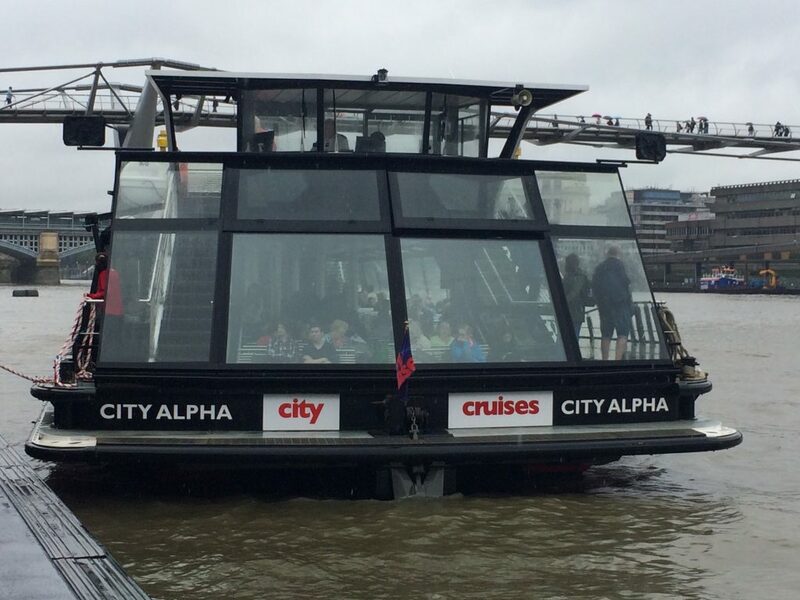 I’d not been on the City Alpha before and have to say it was an excellent vessel for a sightseeing cruise: large glass windows, plenty of seating, cafe and toilets, plus the open-air upper deck. Our Captains for the journey were Ray and Charles and the commentary they gave was mostly correct. But when we stopped at Tower Pier guess what was mentioned at the end of the commentary and what was left by the exit? Yes, begging for tips is still happening and you can see the Captain’s Ice Bucket here by the exit. If you found my efforts as a guide interesting and you would like to show your appreciation to the commentary when you get off the boat I’ll be standing at the exit with a bucket for tips. Again, you might think the bucket has nothing to do with trying to get money off passengers who have already paid for their ticket – a ticket that states the cruise comes with a commentary. So here’s a video of those tax-free earnings landing in the bucket. Kerching, kerching! Yep, even the polite members of staff (and these chaps were polite) are happy to beg for tips from passengers. It’s just part of the culture of City Cruises crew members. As I knew we had another stop at Westminster Pier I was ready to get that evidence again. 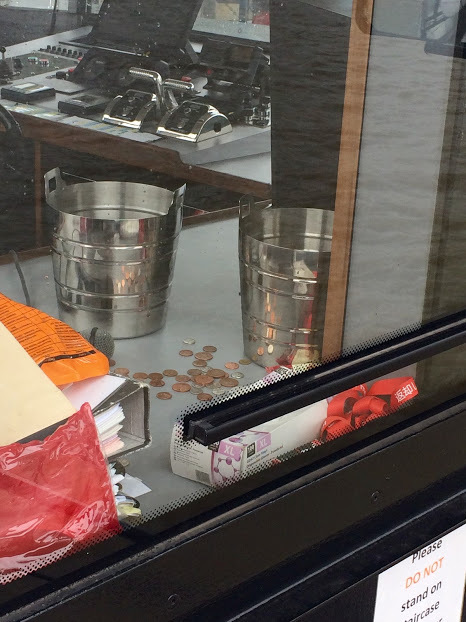 In the Captain’s area of the boat there was plenty of evidence of coins being collected. Sadly, you can see City Cruises haven’t changed their ways, and, let’s be honest, they never will. Seven years of reviews here seems like damning evidence to me. It’s a shame as I will say the latest trip had a better commentary although there’s no way the trip was a good use of my time as we spent plenty of time at the piers collecting more passengers. The commentary was probably the ‘full version’ given out at staff training. There were the same jokes (get married at the top the London Eye and then it’s all downhill from there) and a lot of information given – probably more than needed at times. Why do I think this crew tried so hard? Well, there was a City Cruises member of staff onboard with me as it was part of a ‘press trip’. While this didn’t stop Ray and Charles begging for tips at Tower Pier and Westminster Pier, when we got off at London Eye Pier there was no sign of the bucket. I’ll stick by my previous recommendation: Avoid City Cruises and their crews’ inappropriate begging. They bring London tourism into disrepute. 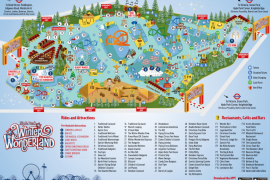 Previous articleIs a 1-day London Pass Really Worth It?